At the time when the SPDP President needs all his working brains some of them are no where to be seen and are hiding in their FOXHOLES expecting not to be involved. One even had the cheek to say,”Forget Politics its too dirty and my rice bowl matters mosts.” Joey and Natasha of audie61 were really caught off guard as it seems the Sun Tzu’s doctrine of “Double Spies” is coming true. An ardent Mawan supporter said,”In the first place who is he to represent SPDP. He has no Locus Standi and this will be creating a war of words betwen the two BN parties. PRS members are non commmital as it will lead to more unnecessary dirty linen being washed in the public. PRS members knows that in order to have a merged entity there must be a proper channel with even an EGM called for. This will create certain tension as the party looks forward to its TDC and with the group parking in PRS its a delicate situation for Masing the President. It seems that the next course of action for Mawan is the undreaded Disciplinary Action “show cause letter” and this will ultimatedly mean the end and the party doors are closed to the 5 plus the 3 SC members. It also means that they have created new ” Viral Infections” for the State BN as the election date closes in. A sms from the SPDP privilege source says,”SPDP to send Show cause letter to unhappy 5 and gang.” Do we need to elaborate whats next…………?? It was well past two thirty in the morning when I put my head on my pillow to catch up with some much needed sleep. I was watching a spirited Chelsea team oozing with confidence and making the young Arsenal team eat “humble pie” The British media has even suggested that with John Terrys frame of mind it will no doubt that conclusively “Arsenal will tame the Lions at their own Den” Result 2-0. Chelseas teamspirit and confidence very much intact. Well. it was a good game and I said my night prayers to thank the almighty one for giving me “A Blessed Day” and said “See You in the morning.” This I have been saying for the past 40 years or more. Even the “cicak‘ (LIZARD) concurred with me when I typed this very sentence. Believe it or not…..One should be dreaming rightly so FOOTBALL..It turned out that just before I woke up around 7.45 am of all the people one could dream of are Two Chief Ministers of their respective states. Both of them are and have been seriously under heavy attack by the BN who are opposition at both these states. Lim Guan Eng of DAP helms Penang while Khalid of PKR holds Selangor. The BN leaders of both these states Koh Tsu Koon (Gerakan)and Khir Toyo(UMNO) losts these two BN states in the lasts GE. Which is Chinese Hockien language and it means,” No bother just tell him.” Maybe the dream is a signal for me to write something about all these hurling of abuses especially from their own coalition members. In recent weeks PKR Zahrain Mohamad Hashim (Bayan Baru) and PKR Tan Tee Beng (Nibong Tebal), have been both at loggerheads with DAP secretary-general and Penang Chief Minister Lim Guan Eng. It is no doubt a smear campaign but are they any truths in so far as why it is so open? 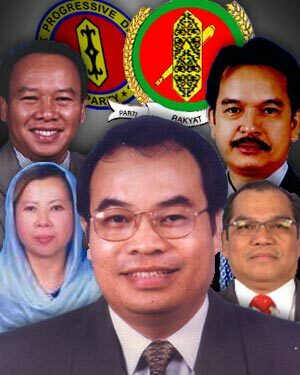 Is there something not too right with Lim Guan Engs adminstration? Is Khalid helping out another fellow Chief Minister by meeting him,discussing on behalf of PKR and smoking away? Well, I got right to business and told Guan Eng,”See you so fasts tell me what I can and not wear while you dont even give me a chance to explain. If Mahatma Gandhi had walked in there will be fanfare right. How judgemental can one get so quickly? In other words its open to interpretations what the media/BN strategists and spin doctors are up to. Sitting at the ‘holy grail’ of the two states is no laughing matter and these two CMs better get used to it. Many before them has tasted the bitter sweet of sitting on the top where very often its a lonely appointment. The mosts important of it all is to defend it at all costs. Chelsea did very well in the scond half with all their might and know how. Similarly I would also say to Taib or Musa if called upon….wonder when its their turn for me to visit…………………….